I had been debating all week whether to attend this show. On the same night, Ben Calvert was putting on one of his regular Bohemian Jukebox events, which seemed like the more convenient option, being in a central location. The Asylum is, I believe, a new venue, located in a part of town I never visit and I had no idea how to get there. Despite feeling a certain loyalty to Ben, my curiosity got the better of me at the last minute and I decided to take a psychogeographic wander through the industrial wasteland to the north of the city centre and check out the new venue. The disused buildings I passed on the way provide the perfect setting for what seems to be primarily a rock/metal club, but Efterklang don't quite fit in with these surroundings. They soon make me forget the bleak scenery outside and instead I start to think of their Danish homeland. I have listened to most of the band's recorded work at home and found it very atmospheric and relaxing. The live show, however, is something else entirely. It is far more rhythmic than I was expecting and two things become apparent as soon as they take to the stage. Firstly, they have two drummers, like Adam and the Ants. Secondly, one of the drummers plays standing up, like the Jesus and Mary Chain. They don't really sound like either of those bands, although comparisons could perhaps be drawn with the rhythmic elements of the Ants' early work. The sit-down drummer sometimes stands up and plays a trumpet. The stand-up drummer also sings, sometimes engaging in luscious harmonies with the female keyboard player. When he's not doing this, he roams the stage playing a variety of hand-held percussion instruments, or just drumming on the ceiling. The music often has an epic, cinematic sound and it seems lazy to compare it to Sigur Rós, so I won't do that. It is reminiscent of a whole host of bands: recent Faust, or perhaps even King Crimson, but the band that repeatedly springs to mind is Mercury Rev. This similarity is impossible to miss on the songs that feature a flute, also played by the singing keyboard lady; nobody here is content with one instrument. What I'm talking about here is the proper Mercury Rev, which many readers may not know or care for. I don't mean the washed-out sound of their last couple of albums, I mean the Mercury Rev of the early 1990s, when they were doing something truly exciting and their live shows were always unpredictable. It has saddened me to watch their gradual decline over the last few years, so it's uplifting to see that their original spirit lives on in Efterklang. The band's name is the Danish word for "reverberation" and is also sometimes used to mean "remembrance". Both of these are very appropriate, given the band's overall sound and also the feelings they invoke in those present. While I've never had any real experience of synesthesia, if I had to use one word to describe Efterklang's sound, it would probably be "colourful". The artwork for their new live album resembles a Paul Klee painting, and if you close your eyes when listening to their music, this is the kind of abstract image that you might conjure up. 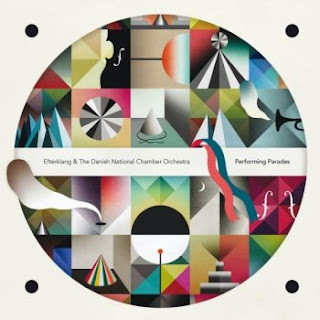 The geometric shapes in contrasting colours could be thought of as representing the different instruments and musical styles that combine in Efterklang's work. They should clash terribly but when brought together, these diverse elements form something unexpectedly beautiful. During "Step Aside", the singer starts to wander around before disappearing backstage. It's not clear whether he is looking for something in particular, or has just been inspired to explore his surroundings by the music coming at him from all sides. He returns after a short while, having found what he was looking for; a glockenspiel. He uses this to play a single note at the climax of the song. The instrument is then discarded and is not used for the rest of the show. However, this small act generates a cheer from the crowd and highlights how each individual element, no matter how tiny, is equally significant to the structure of one of Efterklang's songs. The most enjoyable gigs are often the ones that you go into with no particular level of anticipation, so that they take you by surprise. With Efterklang, I was prepared for an evening of pleasant ambience. I did not expect something that left me still feeling invigorated two days later. I have since revisited their "Parades" album but have been unable to recapture the heights of the live show. If you are intrigued by what I've written then by all means try their recorded output, which has its own artistic merits. But the true joy of Efterklang can only be discovered when you are standing a few feet away from them. These two live clips may give you some idea of what I'm talking about. (You can see me for about two seconds, right at the end of the second clip as the band are leaving the stage.) Those of you with access to services such as eMusic or Spotify might like to do a quick comparison between these clips and one of their albums; there is an amazing level of energy and passion in the live show that they don't quite manage to capture on record. If anyone in Leeds reads this in time, you could do a lot worse than getting yourself down to Stylus at the Leeds University Union tonight where Efterklang are playing as part of the Brainwash festival. After that, the band are on a tour of Europe, so let's hope they return to the UK soon. I really love Efterklang, and had been enjoying several of their albums until I saw them live. Since then, I've hardly listened to them, because the live experience makes the records seem like watercolours - nice, and relaxing, but leaving me yearning for more. So, I'm glad you managed to catch up with them, and I'm sure Ben will understand.